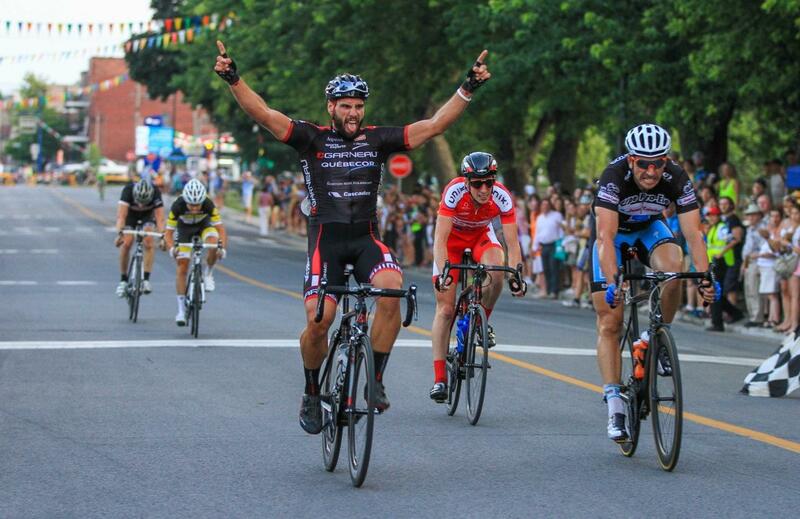 (Lachine, QC) July 22, 2014 – Jacob Kauffman (Garneau Quebecor) of Australia won the 7th stage of the 37th season of the Mardis Cyclistes presented by Jean Coutu with a time of 1:00:33 over 50 km, giving an average speed of 49.5 km / h. Bobby Bailey (Dealer.com), an American, followed closely in second place while Frenchman Matthieu Jeannes (Vélo-Select), was third. The three foreigners had a clean sweep of the podium. There were 94 riders on the start line, including professional cyclists riding for European teams, such as Guillaume Boivin (Cannondale). Another rider, Aurélian Passeron (Syber Pro), is a veteran of the Tour de France. A breakaway of seven riders including Boivin and Kauffman, took a 22 second lead on the pack for the last 9 laps. Jean-Michel Lachance (Silber Pro) then broke away solo with three laps to go before being reeled in by the lead group, mainly through the work of Boivin. In the general classification (GC), Simon Lambert-Lemay (Garneau-Quebecor) is again in the lead with 571 cumulative points; he will again be wearing the leader`s yellow jersey (sponsored by Jean Coutu) next Tuesday. He is followed by Steven Keeping (Transports Lacombe) with 486 points and who will be wearing the red jersey (Specialized-Quilicot) on July 29. Bailey says he is aiming for the black jersey given to the most aggressive rider (Bijouterie Jean-Guy Aubry). It was sunny and warm Tuesday evening in Lachine at 31 C. and light winds. The pro-elite race was marked by a few crashes, including one that left Hugues Lapointe`s jersey in tatters and damaged his bike. Among the women, Marie Soleil Blais (Realdealgears) won the 24 km race, followed by Rosalie Cardin-Houde (SAS-Mazda) and Valina Sintalova (independent) in third. However, it is Adriane Provost (SAS-Mazda) who leads the GC with 252 points, followed by Audrey Bernard (Stevens-The Cyclery), with 221. Among the cadets, Thierry Kirouac Marcassa (NCCH) continued his winning streak, winning the race with a time of 34:26 on 24 km. He was followed by Francis Barriault (CCB Ultimate Cycling) in second position, followed by Griffin Schwartz (independent) third. Kirouac Marcassa also leads the GC with 306 points versus 224 for Barriault. As for minimes, Antoine Dalterio (Espoirs Laval) took the win among the boys with a time 23:45 over 16 km; Dalterio also leads the GC with 386 points. Among the girls, Anne-Florence Boutin (cc Rossi) won the first place, however this is Emma Delisle (CCB Ultimate Bike) who leads the GC with 346 points. The Mardis Cyclistes are presented every Tuesday until August 12, evening of the grand finale. The circuit of the Mardis Cyclistes is located around Lasalle Park in Lachine (STM bus 90). The minimes race begins at 5:30 p.m., followed by junior category competition and women’s race at 6 p.m. The evenings culminate with the Pro-Elite Cup at 6:50 p.m. The races are free for spectators.